We are only dealing with one of Trump's problems here. No matter what I think of the DSM-V (Diagnostic and Statistical Manual), the manual is accepted as the criteria for diagnoses for use by mental health professionals. 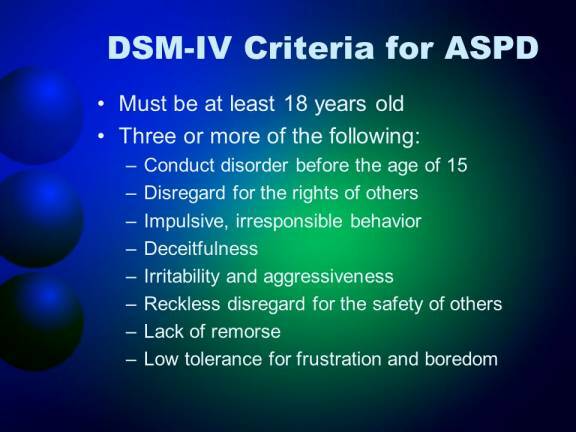 Above is the criteria for Anti-Social Personality Disorder, and has been for several editions. 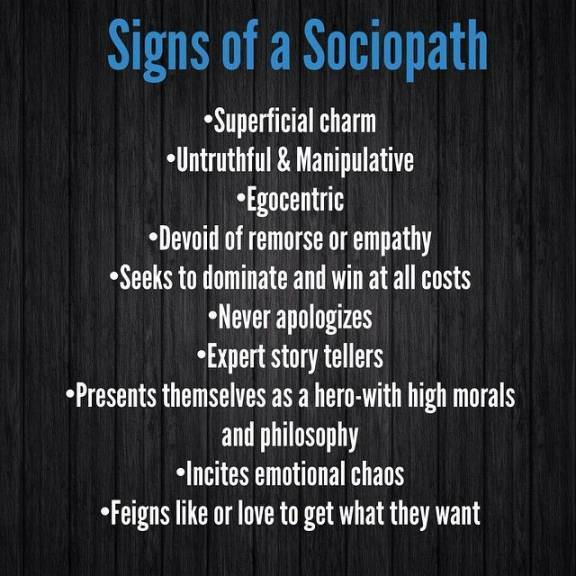 It is relatively easy for anyone reading this to diagnose our President. As I said, it would seem easy to use the term for him. I leave it for the reader to decide. · The Dangerous Case of Donald Trump: 27 Psychiatrists and Mental Health Experts Assess a President"
We continue our interview with someone who's led a discussion of mental health professionals who are deeply concerned about President Trump's psychological instability. Dr. Bandy Lee is a forensic psychiatrist on the faculty of Yale School of Medicine who organized the "Duty to Warn" conference at Yale and edited the best-selling book, "The Dangerous Case of Donald Trump: 27 Psychiatrists and Mental Health Experts Assess a President." AMY GOODMAN: Last month, Pentagon leaders told a Senate panel they would ignore any unlawful order by President Donald Trump to launch a nuclear strike. The testimony came as part of the first congressional hearings in more than 40 years on the president's authority to start a nuclear war. This is Connecticut Democratic Senator Chris Murphy. SEN. CHRIS MURPHY: We are concerned that the president of the United States is so unstable, is so volatile, has a decision-making process that is so quixotic, that he might order a nuclear weapon strike that is wildly out of step with U.S. national security interests. AMY GOODMAN: We turn right now to a doctor who's led a discussion of mental health professionals who are deeply concerned about President Trump's psychological stability. Dr. Bandy Lee is a forensic psychiatrist on the faculty of Yale School of Medicine, an internationally recognized expert on violence. She organized the "Duty to Warn" conference at Yale and edited the book The Dangerous Case of Donald Trump: 27 Psychiatrists and Mental Health Experts Assess a President. The book became a best-seller the instant it was published in October, sold out, resupplied, sold out again. We're bringing you Part 2 of our conversation today with Dr. Lee, when I asked about the concerns that she and these other experts have identified. DR. BANDY LEE: Well, it's actually historically unprecedented that so many mental health professionals have come forth with their concerns, under any president, of any party. So it really is the first time that this many mental health professionals are coming together in a coalition. We even have a website now, DangerousCase.org, where the public and lawmakers can discourse with us. There are thousands of us at this point. DR. BANDY LEE: And, of course, his decision-making capacity, having such levels of impulsivity, having a loose grip on reality and being so fragile in his ability to cope with ordinary stresses, such as basic criticisms or unflattering news, will tend to unravel, especially in times of heightened stress, such as under the special counsel's investigations. AMY GOODMAN: Just last week, Tony Schwartz, author of—well, co-author of Trump's book, The Art of the Deal, told MSNBC's Ari Melber that the president's inner circle is worried about his mental state. ARI MELBER: Wait a minute. You're saying you have knowledge of people calling from a White House line raising that question. Why would they do that? How do you know that? TONY SCHWARTZ: I know that because I know the person that they called. And this is a person who I absolutely trust, who has great integrity. AMY GOODMAN: So, that was Tony Schwartz, who I think ghostwrote the book The Art of the Deal, very close to Trump for a period of time. What are your thoughts about what he said? DR. BANDY LEE: Well, as you know, he has a chapter in the book, even though he's not counted among the 27 experts. We do have three others who have been included for their special insight, their special experience with Mr. Trump. And we included him because he has special insight into these matters. And I would agree with his assessment. We speak often. We share our observations. And we're both deeply concerned. AMY GOODMAN: The chapter that Tony Schwartz wrote in your book, "I wrote The Art of the Deal with Donald Trump. His self-sabotage is rooted in his past." Explain his point here. DR. BANDY LEE: Well, there's actually a lot that's outlined. It's a reprint of an article that he wrote, I believe for The New Yorker. He outlines very much his interactions and experiences with the president. And he describes, most markedly, this emptiness, this—what he calls a black hole level of self-esteem or self-worth that is missing, whereby he can have all the admiration of the world, all of the successes, and he will—his thirst will never be quenched, because of that intense need. And that is what we're seeing, over and over. And what is most concerning for us is that his way of coping with this critical sense of need at every moment, so much, to the point where he cannot think of the past or the future or consequences, his main urgency is to quench the need at the moment. And the way he does this is by burnishing his power, by going to belligerent language or affirming conflicts and others' sense of the world as a threatening place where you have to be violent. AMY GOODMAN: This is Republican Senator Lindsey Graham of South Carolina speaking about, well, then-candidate Donald Trump. This was back in 2016. SEN. LINDSEY GRAHAM: I'm not going to try to get into the mind of Donald Trump, because I don't think there's a whole lot of space there. I think he's a kook. I think he's crazy. I think he's unfit for office. AMY GOODMAN: So that was Graham in 2016. But Senator Graham sounded different last month, when he spoke to CNN. SEN. LINDSEY GRAHAM: You know, what concerns me about the American press is this endless, endless attempt to label the guy as some kind of kook, not fit to be president. AMY GOODMAN: So, that is Senator Graham now. What about what he's saying? DR. BANDY LEE: I think the laypersons, the public or lawmakers, would be prone to underestimating the dangers of this president, because most people are used to seeing individuals who are healthy. It's only professionals who see those who are impaired, day in and day out. And so, the natural tendency will be to interpret what they're seeing in terms of a normal range, a normal variation of human choices, decision making and behavior. What we are—what we feel pressed to do is to warn about the situation where someone is not acting within normal range, where one is normalizing what is in fact a malignancy in one's interpretation of reality. AMY GOODMAN: Dr. Bandy Lee is a forensic psychiatrist on the faculty of Yale School of Medicine, internationally recognized expert on violence. She organized the "Duty to Warn" conference at Yale and edited the book The Dangerous Case of Donald Trump: 27 Psychiatrists and Mental Health Experts Assess a President. The book became a best-seller the instant it was published in October. It sold out, resupplied, sold out again. Questions over President Donald Trump's mental health continue to grow, following his speech on Wednesday where he slurred his speech and mispronounced words during an address on Israel. White House Press Secretary Sarah Huckabee Sanders responded Thursday to the mounting concerns by announcing that Trump has scheduled a physical health exam. Meanwhile, Pentagon leaders last month told a Senate panel they would ignore any unlawful order by the president to launch a nuclear strike. The testimony came as part of the first congressional hearings in more than 40 years on the president's authority to start a nuclear war. We speak with Dr. Bandy Lee, a forensic psychiatrist on the faculty of Yale School of Medicine and an internationally recognized expert on violence. She edited the best-selling book, "The Dangerous Case of Donald Trump: 27 Psychiatrists and Mental Health Experts Assess a President." AMY GOODMAN: This is Democracy Now! I'm Amy Goodman. We end today's show with growing questions about President Donald Trump's mental health. On Wednesday, Trump slurred his speech and mispronounced words during an address on Israel. AMY GOODMAN: White House Press Secretary Sarah Huckabee Sanders responded to questions about Trump's slurred speech by announcing he's scheduled a physical health exam. PRESS SECRETARY SARAH HUCKABEE SANDERS: The president's throat was dry. Nothing more than that. He does have a physical scheduled for the first part of next year, the full physical that most presidents go through, that will take place at Walter Reed. And those records will be released by the doctor following that taking place. AMY GOODMAN: This comes as New York Times chief White House reporter Maggie Haberman commented on Trump's behavior when she was interviewed on CNN last week. AMY GOODMAN: Last month, Pentagon leaders told a Senate panel they would ignore any unlawful order by the president to launch a nuclear strike. The testimony came as part of the first congressional hearings in more than 40 years on the president's authority to start a nuclear war. This is Connecticut Democratic—Democrat Chris Murphy raised some of these questions. But, for more, we're joined by someone who has led a discussion of mental health professionals who are concerned about President Trump's psychological instability. Dr. Bandy Lee is a forensic psychiatrist on the faculty of Yale School of Medicine, an internationally recognized expert on violence. She edited the book The Dangerous Case of Donald Trump: 27 Psychiatrists and Mental Health Experts Assess a President. The book became a best-seller when it was published in October. It sold out over and over again. And I felt that that actually went against the ethical principles of our profession. And so I held a conference in April to discuss the ethical rules, and invited Robert Jay Lifton, as well as a number of other renowned members of my field. And only about 20 people showed up, to a large auditorium. Basically, they were afraid. They were afraid to be—of being targeted litigiously by the president or physically by his violence-prone followers. But when the news got out, in the national and international news, hundreds of mental health professionals got in touch with me. And now we're in the thousands. AMY GOODMAN: So, the movement is called the "duty to warn" movement, your conference, the "Duty to Warn" conference. What does that mean, "duty to warn"? AMY GOODMAN: So you're just back from Capitol Hill. You're urging lawmakers, Democrat and Republican, to call for an urgent mental evaluation of Donald Trump. DR. BANDY LEE: Yes, because usually when there's a sign of danger, it's an emergency. So, what we do is we contain the person, remove them from access to weapons and do an urgent evaluation. This is what we have been urging for with regard to the president. He has shown a number of signs, showing proneness to violence. He has incited violence in the past. He's shown an attraction to violence as a coping strategy of his own. He has taunted hostile nations with nuclear power. Basically, the risk, in our minds, is quite high. AMY GOODMAN: Now, I wanted to ask you—there are those who are really questioning the "duty to warn" movement. There is the disability blogger who said bigotry is not a mental illness. There was a piece that was done by Noah Feldman, "Stop Using Language of Mental Health to Criticize President Trump." And if you can respond to some of this criticism? AMY GOODMAN: Richard Friedman wrote in an op-ed piece in The New York Times, "There is one last reason we should avoid psychiatrically labeling our leaders: It lets them off the moral hook. Not all misbehavior reflects psychopathology; the fact is that ordinary human meanness and incompetence are far more common than mental illness. We should not be in the business of medicalizing bad actors." Your response, Dr. Lee? DR. BANDY LEE: Well, medical—mental impairment is not mutually exclusive with criminal responsibility. In fact, only about 1 percent of murder cases are deemed not guilty by reason of insanity. What we're saying is actually that the combination of mental instability and criminal-mindedness actually makes one more dangerous. So we're basically just warning about danger. We're not making diagnoses. We're calling for an evaluation. DR. BANDY LEE: In my mind, well, that's really not my area. My expertise is in medicine and psychiatry and violence prevention. But when I met with the lawmakers, it seemed that while the 25th Amendment would be the only area that deals with presidential disability, even that is a political decision. In other words, in courts or for legal bodies, we give our expert opinion based on medical data, but all we do is give recommendations. The disability or unfitness for duty, these things are still legal decisions, in all circumstances. It seems in this case it would be a political decision, whereby it can play a role. AMY GOODMAN: We're going to do Part 2 of this discussion and put it on our web exclusives at democracynow.org. Dr. Bandy Lee, forensic psychiatrist, internationally recognized expert on violence, editor of The Dangerous Case of Donald Trump: 27 Psychiatrists and Mental Health Experts Assess a President. She is an organizer of the Yale University "Duty to Warn" conference at the Yale Medical School.